It was Career Day at school and all the students were being asked what they wanted to be when they grew up. Some probably wanted to be firefighters, while others liked the doctor route. However, a little blonde girl – named Darci Olsen – had a different idea than her peers. Showing her self-drawn Van Gogh in class, her demonstrated masterpiece was that of herself as a golf professional. 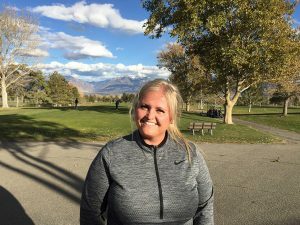 Fast forward to now, Olsen has a Class A status with the Professional Golf Association, she is the head professional at Glenmoor Golf Course in South Jordan, and she is a female in a male-dominated industry – roughly 3 percent of PGA Professionals are women. Olsen runs one of the busiest establishments out of all the courses I’ve stepped foot on this year. Glenmoor GC has men’s and women’s leagues, and it has one of the top junior programs in the state. Olsen’s track is the home course to five high school golf teams, and it played host to a Utah State Amateur Qualifier, which proved worthy for its competitors. From being a successful junior who was known for her blonde ponytail and matching outfits to being a head professional, Olsen has found a lot of success and happiness through the game of golf – a game that has been and always will be a part of her DNA. So, the question needs to be asked. Where did this infatuation with the game of golf come from? After having taken a second to reflect on the question, tears began to build up. Needing just a brief moment to catch her breath and compose herself, Olsen reverently stated her late father. What had started this small obsession for the Dehlin family was the purchase of a new home in South Jordan. One day, Pat “Sweets” Dehlin had been attending a “Parade of Homes” street in the area and came across the dream house for him, his wife and their family. Coming home and telling his wife he felt inspired to buy the house – just a short distance from Glenmoor GC – the two made the finances work despite the house being a little out of budget at the time. Neither of her parents were big-time golfers for the younger part of their lives. In fact, it was Olsen’s oldest brother Devin – the Executive Director of the PGA Utah Section – who initially got the ball rolling when it came to introducing the Dehlin family to golf. (No pun intended!) Olsen recollected about how her brother got his first set of clubs on Christmas as a kid and went to the course to use them that very same day. Because of that move, the Dehlin family pretty much made Glenmoor GC their home away from home. Olsen’s three siblings each worked at the course prior to her. On top of her siblings finding work there, her parents even ran the snack bar, she said. Her childhood memories are also flooded with countless hours spent on a literal bed in her dad’s station wagon, listening to music while her family traveled to the Junior World Championships and Disneyland. As Olsen grew older, her passion for the game of golf never diminished. Graduating from Weber State University with a bachelor’s degree in communications, along with a minor in sales and merchandising, Olsen has found a way to use her degree daily. During her time at college, Olsen played for the Wildcat women’s golf team – continuing her passion to play competitively at a high level. Following college, Olsen dabbled around in the real estate market after starting the process of becoming a PGA Professional. After gaining her real estate license, she debated back and forth on the idea of turning pro. With some success in reality, Olsen ultimately knew deep down she belonged somewhere else – a pro shop. Even though she had passed her Player’s Ability Test (PAT) at the young age of 21 and later left the career field to pursue other endeavors, Olsen knew she had made the right choice to return to the golfing community. Fast forward again a few years, this time Olsen is working at Willow Creek Country Club. Still single, Olsen met a handsome looking devil who happened to help take care of the golf course at the club. Over time, Olsen and her future husband, Joey, dated and eventually got married – talk about a power couple at a golf course: a pro in the shop and an assistant super-intendent on the course. Following their time at Willow Creek CC, the Olsen family made their way down to Roosevelt Golf Course where they managed to land the main gigs, which put them in the position to run the course – initially moving there for Joey’s job offer to be the super-intendent. Having spent some time in Duchesne County, Olsen and her family returned to the Salt Lake area. It was here that Olsen returned to where it all began – the place rich with fond memories from her childhood. Landing the big office in the corner of the shop, Olsen became the head professional of Glenmoor GC – molding the golfing atmosphere in the southwest corner of the state’s capital city and its suburbs into a desired destination for the weekend warriors and everyone else. Now having served her time as an assistant professional at various courses, Olsen has shaped Glenmoor GC into a thriving community with its different leagues, a practice facility for everyone and as stated before, one of the most successful youth programs around. Though filled with passion – a passion passed on from her father – Olsen knew she would not be where she is now if it wasn’t for her dear husband and her two children – a stepdaughter and daughter. In fact, it was Joey who strongly encouraged his wife to get her Class A Status as a PGA Professional. Being on the receiving end of golf’s good fortunes, she believes is it crucial to give something back. Her parents wanted her and her siblings to have every opportunity they could in life. This perspective is demonstrated in her love toward her kids and those she serves daily. When she isn’t at the golf course whether for work or with her family, Olsen loves going to movies, traveling via cruise ship or to Flaming Gorge, and to simply spend time with her family. Darci, as you continue serve those that enter your pro-shop doors, the influence that your dad had on you is and will be manifest in your actions toward others.